Use the brief “Prevention Saves” video provided by Vision 20/20. See the section on Using the Vision 20/20 “Prevention Saves” Video. Develop a regular newsletter to be sent to all segments of the community that you’ve identified. Partner with businesses to place paid media outreach, such as advertisements in publications, on billboards and on transit signage. Internet and Social Media: Creating a presence on the Internet and through popular social media outlets can be an inexpensive and effective way to extend the reach and impact of your fire prevention advocacy messages. See the section on Communicating Via the Internet and Social Media. Media Relations: A strong media relations plan can help you focus attention on the problem of fire and the value of prevention activities. See the section on Working with the Media in this Guide. Presentations: Reach the public through live fire demonstrations, presentations, school outreach and participation in other public events (home shows, school sports, business expos, etc.). See the section on Making Effective Presentations in this Guide. Fire Station Open House: Many departments have annual open houses, often tied to Fire Prevention Month in October. These present the opportunity to get to know residents in your jurisdiction and to help them understand what is involved in fire suppression, enforcement and prevention. With all of these community outreach activities, there are two valuable follow-up strategies to consider. When you find advocates for fire prevention, work to recognize their support and efforts in the community. 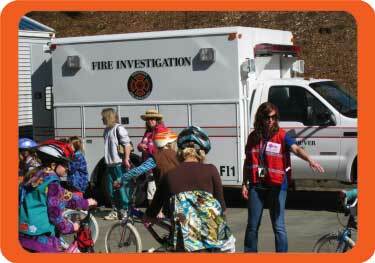 And keep them up to date on fire prevention concerns, activities and achievements. Recognition Program: Create special recognition for those who become fire safety advocates. This can be as simple as providing certificates to hosting formal award ceremonies. The main thing is to let them know you appreciate their support. Citizens Fire Academy: Citizens fire academies can be effective strategies to engage and involve the public in fire safety.